Tag line: "Your Eyes...Your Ears...Your Senses...Will Be Overwhelmed"
As I mentioned in my write-up of Medium Cool, I had taken several mass media courses in college, all geared towards video production (which, at that point in the early ‘90s, was where the jobs were). Yet despite its focus, the instructor dedicated three consecutive classes to discussing the art of film. The first week we watched Eisenstein’s Battleship Potemkin, and in the second we got a chance to analyze Hitchcock’s Psycho. Being a movie fan, I had seen both of these before, but the third week’s film, Terence Malick’s Days of Heaven, was new to me. 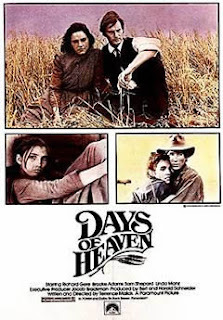 A period piece that whisks us back to the early days of the 20th century, Days of Heaven is one of the most striking motion pictures I’ve ever seen, and it continues to rank among my all-time favorites, a position its held ever since that first viewing. The year is 1916. Following a violent confrontation with his boss, Chicago steel mill worker Bill (Richard Gere) hops the next train out of town, taking with him his girlfriend Abby (Brooke Adams) and his adolescent sister Linda (Linda Manz). The train carries the trio all the way to the Texas panhandle, where Bill and Abby get jobs (alongside hundreds of immigrants) harvesting the fields of a rich farmer (played by Sam Shepard). To avoid any controversy, Bill and Abby pretend to be brother and sister, a lie that works to their advantage when the Farmer, who Bill learns is dying of an unknown illness, falls in love with Abby. Hoping to get his hands on the farmer’s wealth when he passes away, Bill convinces Abby to marry the farmer, thus setting herself up to be his sole heir. But as the months drag on, the farmer’s health seems to improve, and Bill finds himself on the outside looking in when Abby begins to develop feelings for her new husband. Most movies, especially those as visually stunning as Days of Heaven, have no need of a narrator; the images speak for themselves. Yet the narration provided by young star Linda Manz is one of thIS film’s best features. Along with sharing a few of her thoughts on its various characters, Manz’s Linda is often as observant as Malick’s camera, commenting on things that don’t necessarily forward the plot, but add to the film’s reflective tone (“Nobody’s perfect”, Linda says at one point in her thick New York accent. “There was never a perfect person around. You just have half-angel and half-devil in you”). Yet what truly makes Days of Heaven such a noteworthy motion picture is its gorgeous cinematography (handled by both Nestor Almendros and an uncredited Haskell Wexler) as well as Malick’s keen sense of what makes a particular image so interesting (in one of the documentaries presented on the Blu-Ray, we’re told that Malick didn’t really follow a shot plan, choosing instead to film whatever caught his eye). Days of Heaven does feature a few memorable moments, such as the locust infestation that threatens to ruin the farmer’s crop; and the fire that spreads out of control when he and the workers try to drive these pesky insects away. But the movie is at its best when, as with the narration, the visuals don’t serve the story (some extended shots of the workers toiling in the fields are positively breathtaking). With its emphasis on imagery over story, Days of Heaven may seem overly pretentious to some viewers. For me, though, the visuals were more than enough to hold my attention; you could lift just about any single frame from this film and hang it on your wall. Days of Heaven is arthouse cinema at its most engaging. I didn't get a chance to see Days of Heaven in the theater because I was still a minor. But, a couple of years later I was able to see it on Showtime in letterbox and without commercials. The beauty of its shots were compelling and have become legendary. I'm honestly surprise that more people don't see this film. One of my favorite scenes is where our young narrator and her friend go out to meet up with her bo' from the navy, and the results of that venture. Instead of doing a hard closeup to capture the emotion the encompassing scene and body language caught the moment and took ordinary scenery and made it unique and memorable for that specific moment. Few films put such effort into their structure.